I know everyone is probably pretty sick of these Taste of Inspirations Greek Frozen Yogurts popping up on the blog recently, so I'll make this one very quick. This is a respectable product considering it's a mere $2, but the strawberry does that yogurt thing where I keep thinking I taste cheesecake. I hate when that happens and I know many of you think I'm a little crazy when I say it, but that's just the way it comes across. 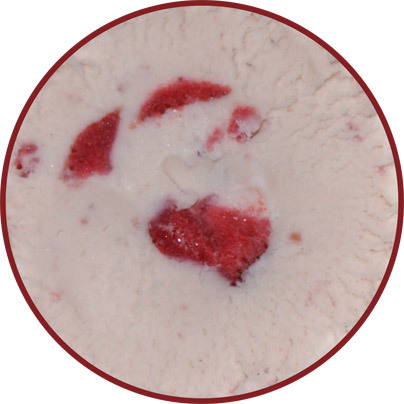 It's not a bad product, it's got the texture going for it and I love the strawberry chunks, but next time I buy a pint, it'll either be the Black Raspberry or Pomegranate & Blueberry flavor instead. 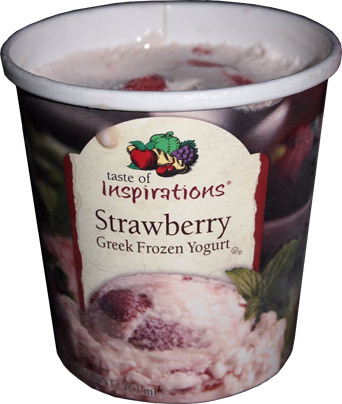 Notes: Taste of Inspirations is the house brand for Food Lion & Hannaford's Supermarkets. reppin that north eastern pride I see! I've never actually tried hannafords store brand, but It does look pretty solid. Might give it a go next time around. I try to stay away from store brands but their greek froyo is just so surprisingly well done that it had to be talked about. You should definitely try it and let us know what you think. Hey Mitch, I'm out of NY as well and I have a couple of questions for you if you don't mind. Send me an email if you have the time nickrovo at gmail dot com.